2 Fat Nerds - Biking Buffalo: Surprises at Every Turn. Biking Buffalo: Surprises at Every Turn. Home/Buffalo, Health, Travel/Biking Buffalo: Surprises at Every Turn. As I steadily gear up toward a triathlon in August, bicycling long distances has become inevitable. I was slated to do ~25 miles on Sunday, which got me thinking about potential routes to take. Twenty-five miles is quite a long distance, even by car. Fortunately, the urban sprawl that is the city of Buffalo is a fairly friendly place to bike! 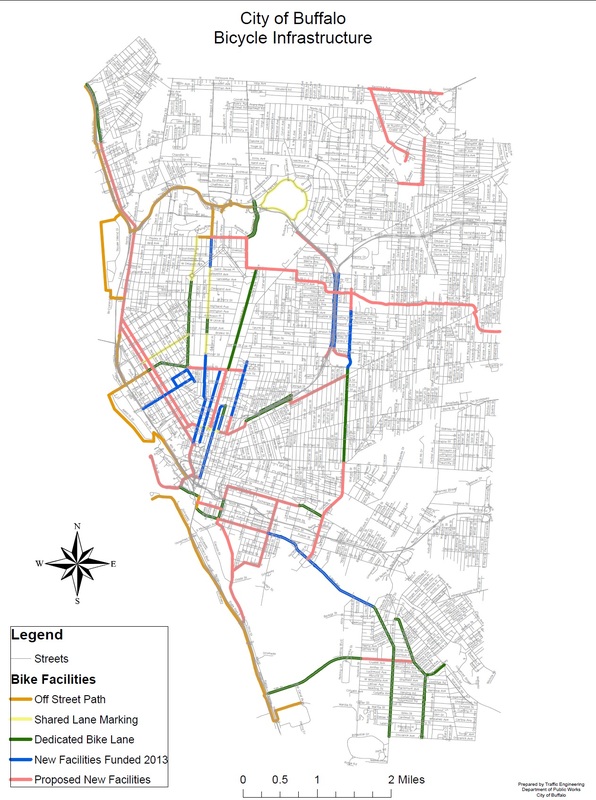 Buffalo planners have recently pledged to fulfill a “Complete Streets” plan. The idea is for all new redevelopment and repaving to accomplish three things: multimodal, green design, and smart planning. Multimodal simply means the design should accommodate vehicle traffic, bicycle traffic, and pedestrian traffic in any updates. Green designs include water retention, roadside flowerbeds, and permeable surfaces. Smart planning means more electric-vehicle hook-ups, better traffic patterns, and so on. What does all of this mean in reality? Apparently more than I would have ever given the urban planners credit for if I had just read about the plans in the newspaper. On Sunday I was able to bike 26 miles, more than half of which were on urban bike trails featuring gorgeous views of the Niagara River, the Lake Erie Marina, and the Erie Canal. This trek didn’t utilize any of the most recent updates to the city streets, either, which allow me to ride from the Olmsted Parkway system all the way downtown to the outer harbor (~10 miles in bike-only street lanes). They are building a fairly extensive system that really allows you to travel the majority of the city by bicycle. What this doesn’t show, however, is the ten-plus miles of already-built trails all the way along the Niagara River, which connects into the Erie Canal bike trail headed east. This is the segment I rode. Along the way, I was happily surprised to stumble upon the Canal Festival in Tonawanda, see the amplitudes of people fishing along the river, watch hundreds of boaters enjoying the water, and see many more dog walkers, strollers, and bikers all out enjoying themselves. I never really realized how much riverfront park space the city really has. It was like unlocking a secret area hidden behind a layer of broken down industrial buildings, that were intentionally hiding these beautiful parks to ward off the swarms of people who would inevitably flood them if they were ever discovered. I think the single most important thing I’ve learned since starting 2 Fat Nerds is that the number of options and things to do in the outside world is truly immense. There are new things to discover each and every day, but it requires a little bit of effort. I’ve realized that you can see and do so much more by leaving your car at home. Yes, Buffalo is awesome! Been telling you that for years.